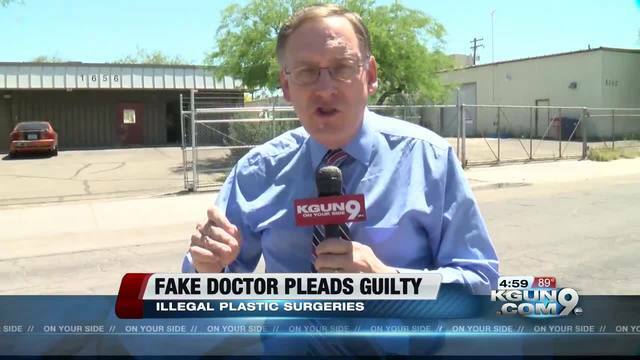 TUCSON (KGUN9-TV) - He was a fake doctor, but he's in real trouble. Gustavo Nunez convinced patients he was qualified to do plastic surgery from breast augmentation to liposuction. Some of his patients ended up hospitalized. Some of them nearly died. Friday he pleaded guilty to 28 of the 70 charges against him. Gustavo Nunez was a man women paid to slim down their bodies and build up their breasts. He was not a doctor. Some of them ended up in the hospital. There were so many victims, he could face up to 178 years in prison. For about three years, Gustavo Nunez did everything from Botox, to breast augmentation to liposuction. Some of the beauty treatments had ugly results. "It came to light when some of the victims started showing up at the hospital, says Assistant Arizona Attorney General Jordan Emerson. Investigators collected the evidence they needed, but left behind signs of what went on in the office. An exam table is in what's now a storeroom. Prosecutor Jordan Emerson says fancy certificates helped build the illusion. “And when you look at a wall behind a doctor's desk and see these framed diplomas you don't necessarily look very closely to see what they are and I think a good take-away here is look into the person you're going to for medical procedures." Nunez was facing 70 charges. His plea deal drops the charges to 28. When he's sentenced in August the judge could give him as few as 13 years or as many as 178. He could also pay victims up to a million dollars for all of the damage he's done.